Trixi and Jon aimed to renovate their 1970s home on a shoestring — it’s the times, you know — and heck, doesn’t it make for a much better story to get all creative rather than just throw lots of money at the problem. 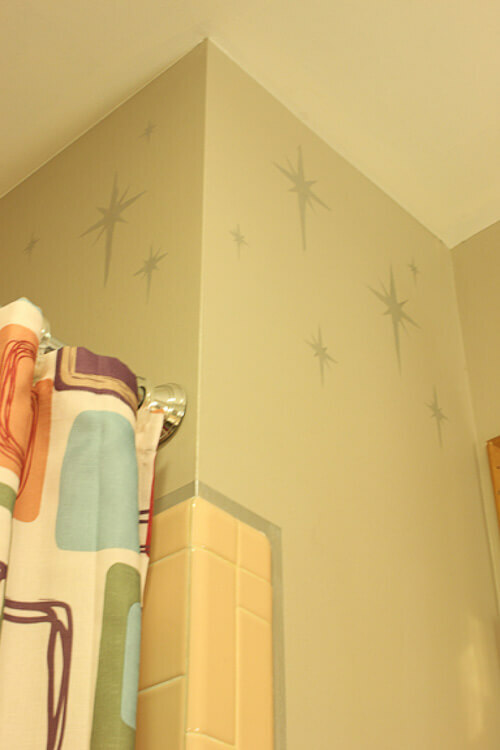 In this story, I spotlight two readers who made hand-cut stencils — in atomic starburst patterns — and painted them onto their walls with bright gold paint. At first glance, most everyone thinks they used wallpaper — but no, they saved a lot of money with their homemade stencils instead. Read on for tips and even a free pattern made by another reader. The template for the stencil was made out of solid plastic stencil sheets from Michaels Crafts. 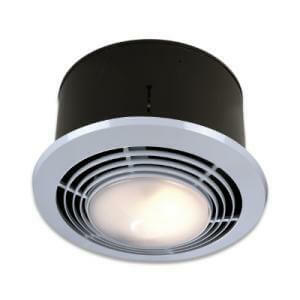 We just mimicked the pattern from our atomic bar light that’s in the bath, and used a finer tip artist knife to cut it out. I used gold acrylic fabric paint, which was very easy to clean-up if I had to step away for any length of time. If it dried onto the stencil tools, I just peeled it right off and kept going. It took the better part of a day to do the stenciling – but even that was fun! I just did 3 on a page and rotated the page upside down on every other one I would do. 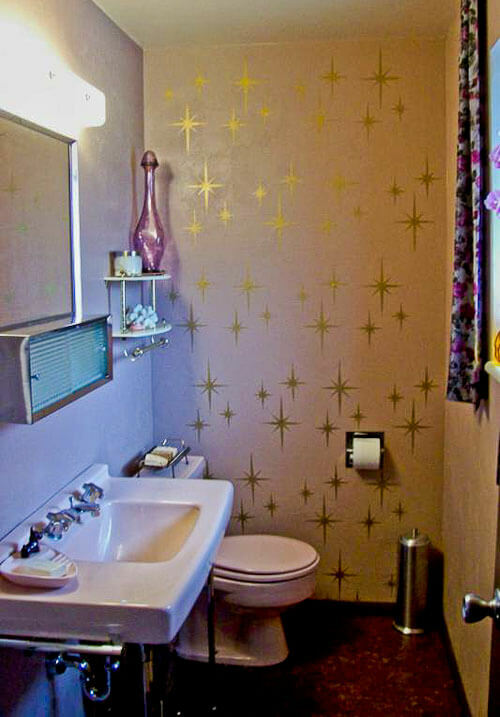 April 2012: Jim and Kathleen used this stencil design, too, in the 1960 pink bathroom. 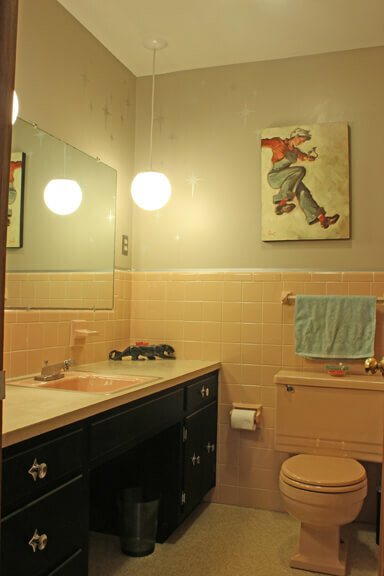 They used metallic silver paint for the starbursts… and even outlined the bath/tub shower surround in metallic paint, too. Looks great! Getting a crisp edge definitely is about not over loading your tool and not working with a heavy hand. The point is to not drag your tool from the open space over the edge, if the edge is lifted even the slightest bit it will catch the paint, lay back down, and create a rough edge. Practice on a painted board to get the feel of the right amount of paint on your tool and how light or heavy handed you should go. First you want to spray the back of your stencil with stencil adhesive, I use a spray glue but be careful if you do as it can be too sticky and leave a glue residue. Stencil brush — dab into a little paint or glaze, swirl a lot of it off onto toweling, apply by swirling onto stencil with a medium hand, working from the stencil edge into the cut space. 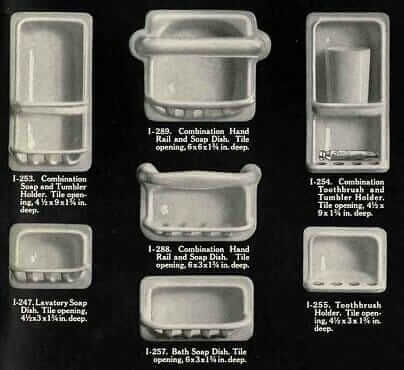 Cosmetic sponge — dab into paint, dab off on toweling, dab onto cut out area working your way to the edges. Roller Sponge — roll into paint, roll off on toweling, roll without much pressure over cut space of stencil, rolling in different directions. Do not press hard, it will squeeze out of roller and go under stencil. I also like to use a worn out smallish brush especially if you have a tight or narrow stencil. Apply some paint, swirl off onto toweling a bit and then brush from the stencil edge into the cut open space, this gives a little bit of a cross hatch when looked at up close rather than a mottled look that the swirling in the stencil cut will give you. You can also stipple into the cut out space with a flat bottom stencil brush but this is more time consuming. Karen said that she bought the stencil paper and paint at Hobby Lobby. 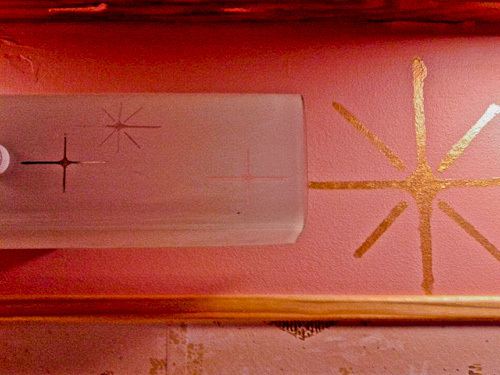 I just stenciled the stars onto the wall behind my bookcase headboard, (a peachy pink wall) and used silver metallic. It is AWESOME! I can’t get over what an impact it made. I made one star on paper re Karens instructions (8×10) then reduced it on the copier by 75% and 50% so they’d all be the same, then traced them onto the stencil blank and cut them out. You could also use the stencil with a clear gloss paint on a flat wall. Wouldn’t that be cool! Thanks for this! I’ve been looking all over for a template for a starburst! This is PERFECT! And thanks Nancy for making a stencil of it! Yeah!!! I’m so excited! A stencil example to print-out. 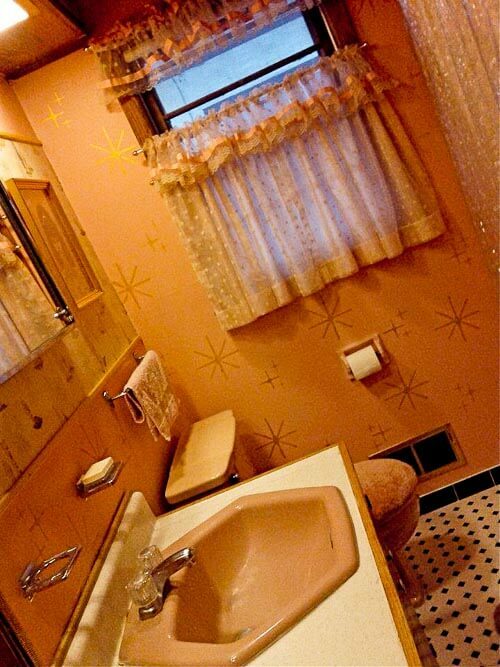 Our house had pink bathroom tile with this design on some tiles. 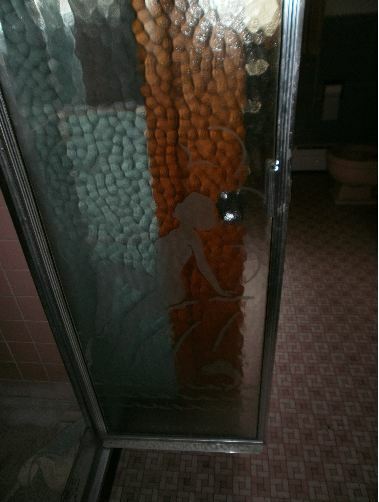 Unfortunately, there was damage and rot throughout and we demoed the bathroom. But, I always liked that starburst pattern. Since wallpaper can be insanely expensive if you include labor – this looks like a do it yourself project that will be fun! Do we know the name of the wall color Jim and Kathleen used for their walls? I’m hoping to do a silver starburst on a similar shade but can’t for the life of me find the perfect shade!